Aaron Swartz death: #pdftribute hashtag aggregates copyrighted articles released online in tribute to internet activist. Photograph by Nick Gray via Wikimedia Commons. The untimely death of 26-year-old Internet folk hero Aaron Swartz has inspired a movement: Academics, researchers, and activists are releasing their copyrighted work online, for free. It’s a fitting tribute to the copyright reform and Internet freedom activist, and it’s catching on fast. Participants are using the #PDFtribute hashtag when linking to their work. Those links are aggregated here and here. As Michah Allen, who posted a Reddit comment that partially inspired the idea, noted in a blog post, the tribute is directly inspired by Swartz’s open access advocacy. The idea took off after Jessica Richman and Eva Vivalt, who’d independently thought up a similar tribute, came up with the hashtag and got Anonymous to help spread the word. At this point, the hashtag has been tweeted out well over 30,000 times. Those with access to these resources — students, librarians, scientists — you have been given a privilege. You get to feed at this banquet of knowledge while the rest of the world is locked out. But you need not — indeed, morally, you cannot — keep this privilege for yourselves. You have a duty to share it with the world. And you have: trading passwords with colleagues, filling download requests for friends….But all of this action goes on in the dark, hidden underground. It’s called stealing or piracy, as if sharing a wealth of knowledge were the moral equivalent of plundering a ship and murdering its crew. But sharing isn’t immoral — it’s a moral imperative. Only those blinded by greed would refuse to let a friend make a copy. #PDFtribute speaks to Swartz’s life work but also to the circumstances surrounding his suicide. Swartz, who allegedly suffered from depression, was mired in a legal battle after he allegedly accessed and downloaded almost 5 million articles from the JSTOR academic database via the Massachusetts Institute of Technology’s computer network. Although, as the Wall Street Journal explains, JSTOR has said they weren’t interested in pursuing a case against Swartz, federal prosecutors went ahead with one anyway. Just before his death, Swartz learned that prosecutors had declined to pursue any plea bargain that would have kept him out of jail. Swartz’s family released a statement following his death blaming the U.S. attorney’s office for his suicide. 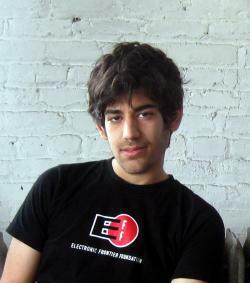 For more on Swartz’s work and legacy, read Slate’s Matt Yglesias, and Andrea Peterson.